Over the course of our life, there will be threatening times when we find ourselves seriously needing God’s intervention and help. Over the course of our life, we will face threatening situations that have us seriously concerned about our well-being or even our survival. 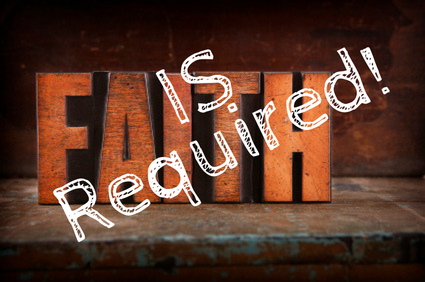 And, in these threatening times and situations, God requires that we have faith in Him! As we just read in these scriptures, the Disciples were facing a very real and a very serious situation…one that was in fact life-threatening. The great storm they were in had filled their ship so full of water that it was in imminent danger of sinking…which in turn meant they were in imminent danger of drowning. Now, before we criticize and condemn the Disciples, let’s consider ourselves. Problems with a loved one. Interestingly, in one variation after another…in one incident after another…all five of these scenarios are repeatedly described and addressed throughout the Bible. Over and over, the Bible instructs us to have trust, confidence, and faith in God even when we are in one of these five scenarios. Having faith in God does NOT mean that trouble will never touch us, affect us, or impact us. In Chapter 6 of the book of Daniel…we can read that Daniel’s faith in God did not exempt him from getting thrown in the lion’s den. Likewise, in Daniel chapter 3, Shadrach, Meshach, and Abednego were being threatened by the world’s most powerful ruler…the sweat was rolling down their forehead from the heat of the nearby furnace…and yet, as great as their allegiance to God was…as great as their confidence and faith in God was…they were not exempted from being thrown into that fiery furnace. If we read about the Children of Israel in the wilderness, we find that ultimately God always provided them with the water they required for survival. But, there were times when He expected them to be okay with not having any water and being thirsty until He provided them with their necessary water. True faith is okay with being hurled about by the storm. True faith is okay with getting soaked. True faith is okay with storm waters continuing to rise, even when they are creeping up around our ears and our nose. No matter what is going on…no matter how loud the thunder…no matter how close the lightning strikes…no matter how hard the wind blows…no matter how wet we get…true faith is at rest and at peace. …EVEN WHEN our problems are affecting and impacting us physically and temporally…EVEN WHEN our troubles are threatening our well-being…EVEN WHEN it appears…that is, when all observable and tangible evidence indicates…that our survival is in dire jeopardy. Of course, when things are going well for us, this kind of faith is relatively easy for us to grasp intellectually…it is even easy for us to imagine ourselves exercising this kind of faith in an imaginary threatening situation. But, when threatening times and situations actually come to us in real life…well, then it is a different story…then it is easy for us to lose our faith in God…and to be emotionally filled with doubt, fear, and dread. But, it is precisely in those threatening times and situations that God requires us to have faith in Him. Referencing back to Mark 6:6, when troubled times and threatening situations arise in our life, will the Lord marvel at us for our faith…or will he marvel at us for our unbelief? Brothers and Sisters in Christ, when troubled times come our way…when we find ourselves in threatening circumstances…let’s do our best to please God with our faith, trust, and confidence in Him. This is what it really boils down to: when we have a spiritual love and admiration for the Lord…as well as a spiritual connection…that transcends all physical and temporal things…then we have a real “relationship” with the Lord…and when we have a real relationship with the Lord…then there is a corresponding “faith” in place that frees us from all worry and concern over our physical and temporal needs…because we KNOW that God WILL take care of them in one way or another.